The 2011 Infologue.com ‘Building the Future’ Award winner is David Evans, the British Security Industry Association (BSIA) Project Director-2012, and is responsible for focusing the work of the trade association for the 2012 Olympic Games. David Evans has received the award firstly for his work on the origination of the LOCOG Bridging the Gap initiative which will result the infusion of young students into a career in the private security industry and secondly for the promotion of the private security industry to the 2012 Olympic Games stakeholders, including the UK Government. David Evans co-ordinates 2012 issues for the UK Security & Resilience Suppliers Community (RISC) where he is co-Chair of the 2012 Security Industry Advisory Group with the Olympic Security Directorate’s (OSD), Director of Safety and Security. David was awarded the Imbert Prize in 2010 for his work on the origination of the LOCOG Bridging the Gap initiative, where he now sits on the Board representing industry and legacy. David has 30 years’ experience in the security industry, and his current role at the BSIA role involves fostering an environment whereby BSIA members are recognised as the leading resource for private security services in the UK and ensuring that BSIA members are fully aware of the opportunities available to them. London 2012 will be the first Games where all security staff will hold a relevant qualification – in the past any shortfall has mostly been met by volunteers. In 2003, Logue Corporate introduced the Infologue.com ‘Building the Future’ Award, which is bestowed upon the person or organization that – in the view of previous recipients who are still active in the UK licensable security sector as a collective – has created over the past 12 months, the most significant footprint on the road to a vibrant, professional and mutually profitable guarding industry. This award is presented jointly by the Editors of Infologue.com and SMT Online, and sponsored by Interconnective Limited. 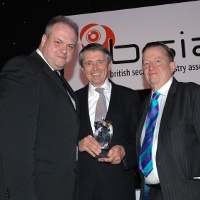 Previous winners have included such industry luminaries as former British Security Industry Association Chief Executive David Dickinson, security industry company chairman Bill Muskin (VSG) and Chief Executives David Beaton (G4S), Stuart Lowden (Wilson James) Ian Nisbet (G4S Cash Services) and last year (2010) posthumously to Jǿrgen Philip-Sǿrensen CBE MA (JPS).